Now that your turf is finally out from under a blanket of snow and getting a strong dose of April showers, you might notice a patchy appearance on the lawn or areas that appear matted and brown. These symptoms are likely a byproduct of turf diseases that were festering in the lawn during one of the most snow-covered years on record in Northeast Ohio. You see, grass doesn’t completely hibernate in winter—disease activity is actually occurring underneath the snow. Come spring, we notice the disease aftermath, so jump-starting a lawn care program is important for establishing a sustainable commercial landscape that will stay healthy. 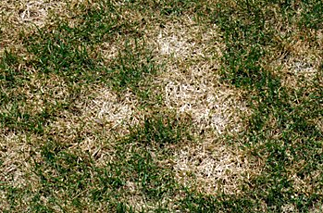 This spring, we are seeing a few common grass diseases on the commercial properties we serve in Northern Ohio: pink snow mold, gray snow mold and red thread. We’re also keeping an eye out for dollar spot, which tends to crop up in lawns in late spring and early summer. 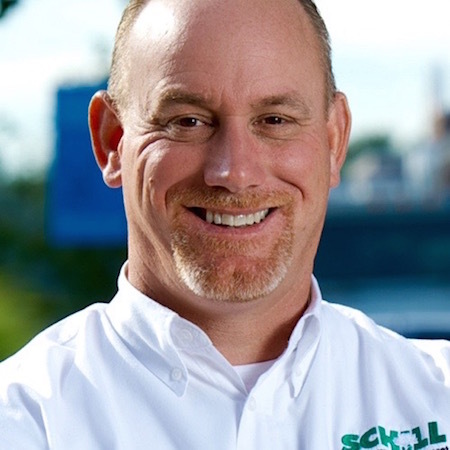 Here is a roundup of symptoms to watch for in the grass and how a professional landscape company like Schill identifies and manages these grass diseases in Northeast Ohio. This mold is only a concern following winters when the turf has been covered in snow for 60 or more consecutive days. 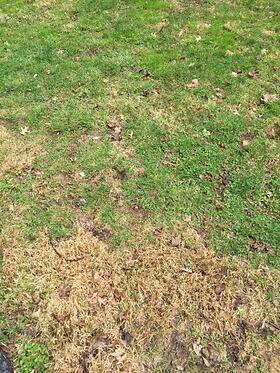 This year, we are seeing episodes of gray snow mold, which appears as brown, matted turf that has a gray tinge to it. Sometimes you’ll see it in areas where plowed snow piles sit for long periods of time, but this year entire lawns are susceptible because of the long-term snow cover we experienced January through March. Prevention: There’s nothing you can do about snow cover on your turf, but you can take steps to ensure that your lawn goes into winter prepared to weather the storm. We are careful to avoid excess fertilization in fall, which promotes grass growth going into winter. A thicker lawn traps moisture and harbors disease more readily. Be sure that leaves and debris are cleaned up from the lawn before snowfall to give turf the best possible chance of “breathing” during moisture-heavy months when snow is sitting on the lawn. Treatment: The grayish, matted patches of lawn will repair over time with adequate exposure to sunlight and proper air circulation. We do not recommend raking and re-seeding these areas because the agitation can actually do more damage to the turf. If the grass is not drying out, we may look for ways to improve drainage on the property. 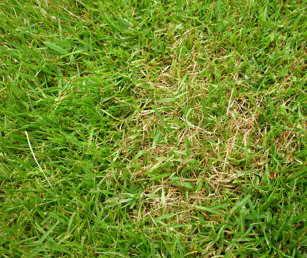 You’ll know pink snow mold from its circular patches that can have a pink sheen when the lawn is wet. Gray and pink snow mold often co-exist, and prevention and treatment measures are the same. Prevention: Take fall cleanup seriously, so leaves and debris do not act as a blanket, trapping moisture into the turf. Again, avoid fall fertilizations that stoke grass growth before winter, which give moisture more grass blades to cling to and damage. You might also consider a fungicide application during late fall maintenance. Treatment: Time and drier weather conditions are the best medicine for this mold. We generally do not treat this disease unless there is a particularly heavy infestation. Starting a lawn nutrition program is the best way to jumpstart healthy turf growth and regenerate a lawn. We do not recommend raking and re-seeding — pink snow mold does not cause actual damage to the turf. The crown and root system is still alive, so with proper feeding most commercial properties bounce back rather quickly. If your turf was weak going into winter, it probably did not have the strength to withstand our cold temperatures and snow cover and could be suffering from one of the most common lawn diseases we see at this time of year: red thread. Is your lawn thinning out? Do you notice patches that are 4 inches to 2 feet in diameter? From a distance, those patches appear reddish because of the thick, red strands of fungal growth infecting the lawn. These threads spread the fungus to healthy plants. When a lawn is wet, you might notice tufts of pink, fuzzy mycelium. This disease is unsightly, but it will not threaten the health of your lawn over the long-term. Time and warmer temperatures will strengthen the turf and snuff out the disease. 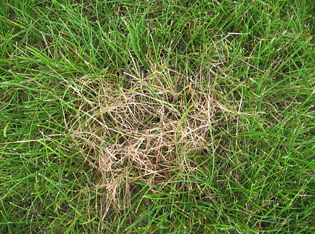 Prevention: Proper lawn care practices during the growing season are important for preventing diseases like red thread, which sets in because turf health is compromised. Ultimately, red thread is a nutrient deficiency disease. Treatment: As with the previous two diseases, turf will recover from red thread with time and the right turf care program. Cultural practices including aeration are important and necessary for airing out the lawn and decreasing compaction and thatch that can trap moisture and cause turf to harbor disease. Dollar spot can form once night temperatures consistently exceed 50° F. Spring weather in Northeast Ohio creates the perfect storm for dollar spot: cool, wet, overcast conditions. Nitrogen-deficient lawns are more susceptible to dollar spot, as are lawns that have a heavy layer of thatch that traps moisture. You’ll know dollar spot by the straw colored patches that are the size of a silver dollar. Prevention: As with many lawn diseases, cultural practices are helpful, including aeration to open up the turf stand and dethatching to remove the layer of dead matter that can form between the soil and turf surface. Proper watering is also important: you want to avoid light, frequent watering that will cause moisture to get trapped in the grass rather than reaching the roots, which actually need the nourishment. Treatment: Dollar spot generally goes away in mid-summer, once temperatures reach closer to 90° F — that can be as late as August in Northeast Ohio, depending on what kind of weather we experience this coming season. At Schill, we act as an extra set of eyes on your commercial property, constantly keeping a watch for potential weak spots, so we can strengthen the grass using cultural practices and an appropriate turf care program. Healthy grass is sustainable grass. 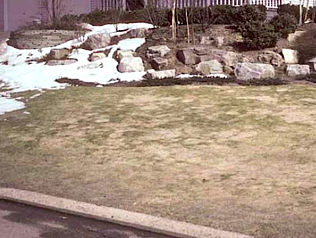 The three most common spring lawn care diseases we see — snow molds (pink and gray) and red thread — can be prevented by keeping the lawn healthy during the growing season and fortifying turf with nutrition in spring. Let’s talk more about how to keep your commercial landscape healthy year-round. Call us any time at (440) 327-3030, or fill out this simple contact form and we’ll get in touch with you.